Be the first to share your favorite memory, photo or story of Ellard. This memorial page is dedicated for family, friends and future generations to celebrate the life of their loved one. 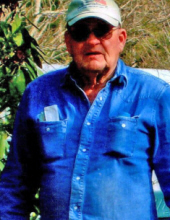 Ellard Carl Bolick, 82, of Franklin passed away Thursday, April 11, 2019. Born in Macon County, he was the son of the late Carl Allen Bolick and Eva Cordelia Bolick. In addition to his parents, he was preceded in death by his wife, Sylvia Alice “Took” Bolick; daughter, Carla Reilly; two brothers, Loyd Bolick and Willard Bolick; and three sisters, Edna Bowers, WillaMae and Burdell Bolick. Ellard was a member of Pine Grove Baptist Church and he enjoyed helping others. He is survived by his two children, Kathy Mewborn (William Carl) of Monroe, GA, and Marty Bolick (Annette) of Toccoa, GA; son-in-law, John Reilly of Asheville; sister, Anna Lee Massagee of New Mexico; brothers, Odele Bolick (Helen), Bobby Bolick (Otela), and Marvin Bolick (Phyllis) all of Franklin; sister-in-law, Eloise Bolick of Wooster, OH; six grandchildren, Tosha Austin, Mandy Tobin, Will (Erica) Mewborn, Morgan Bolick, Madison Tremblay (Cris), and Johnathan Reilly; seven great-grandchildren; and many nieces and nephews. Funeral Service will be held at 3 p.m. Saturday, April 13, in the Chapel of Macon Funeral Home. Rev. Greg Rogers will officiate. Burial will be in Woodlawn Cemetery. The family will receive friends from 1:00 p.m. to 3:00 p.m. prior to the service at Macon Funeral Home. To send flowers or a remembrance gift to the family of Ellard Carl Bolick (Courtesy), please visit our Tribute Store. "Email Address" would like to share the life celebration of Ellard Carl Bolick (Courtesy). Click on the "link" to go to share a favorite memory or leave a condolence message for the family.